Charlotte Tilbury Airbrush Flawless Finish Powder Vs Genius Magic Powder. Do you need both? As regular readers will know, I have dry skin and that means that I avoided powders for years as they just aged my skin and generally made my makeup look cakey. I don't necessarily need a powder to make my base last longer but I do find that my base looks more polished when I finish it with a powder. I had more or less given up on the idea of finding one that would work on my skin and that I could use regularly until my lovely friends Leanne, Dorota and Dagmara gave me Charlotte Tilbury Airbrush Flawless Finish Powder for my birthday last year and I loved it instantly - so much, in fact, that I'm am now on my third one! 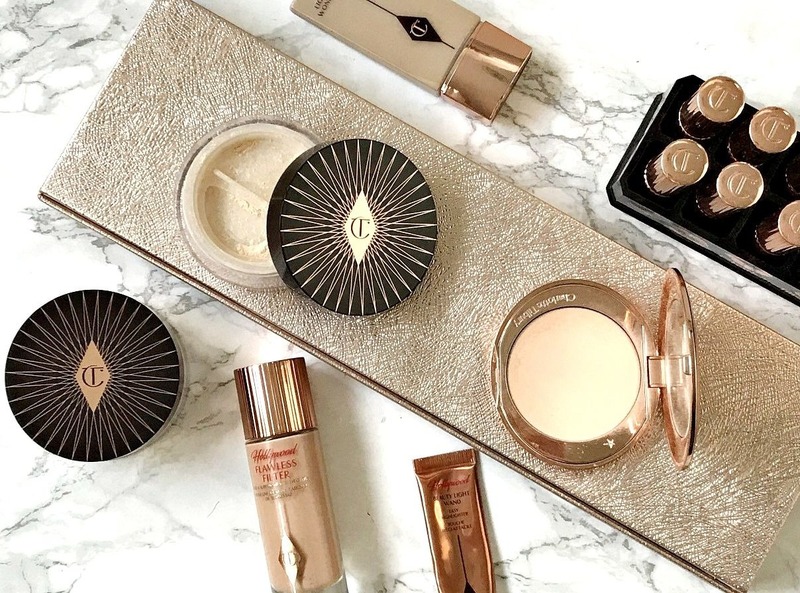 When Charlotte Tilbury Genius Magic Powder was released, I didn't 'need' it but I wanted it so today I want to share my thoughts on both with you. Charlotte Tilbury Airbrush Flawless Finish Powder: As with all Charlotte Tilbury products, the packaging of this powder is stunning - rose gold with burgundy accents, although it is plastic, which surprises some people as I think they expect something heavier. I like the lightweight packaging as it's ideal for popping in my handbag and there is a decent sized mirror inside the lid. The powder itself has a silky soft texture - it's so finely milled that it's undetectable on the skin and it also doesn't feel like there is a layer of product on the skin. I find that this powder blurs the look of my pores and finishes my base makeup with a demi-matte finish without making it look flat. It contains rose wax and almond oil, both of which help to hydrate the skin yet they don't make it look dewy or glowy - they just help to prevent the powder from settling into fine lines. It's the perfect powder for normal/dry/combination skin. Charlotte Tilbury Genius Magic Powder: Again the packaging is stunning - a burgundy lid with rose gold accents and monogramming and inside there is a plastic dispenser, which can be slid around to prevent any fallout when the lid is on. I usually associate loose powders with having a matte finish but this Genius Magic Powder is different because it adds a hint of luminosity but it isn't dewy or necessarily glowy - just fresh, radiant skin! This is a very lightweight powder - you could actually add a few layers without it looking heavy or cakey, yet it isn't so lightweight that it does nothing for the skin. I find that it brightens and gives a blurred effect to my skin - almost like a soft focus filter but it really is like magic because it doesn't necessarily look like you've powdered your skin, it just looks like you have a healthy and radiant complexion. A little goes a long way with this powder so I don't see myself finishing it any time soon! Charlotte Tilbury has done it again! Both powders are game-changers if you have dry skin - they will work for other skin types too but I know that the struggle to find a powder is real when you have dry skin as most highlight lines you didn't even know you had and generally age the skin. If you have never found a powder that worked for you or even if you are just in the market for a new powder, I highly recommend picking up one of these. You don't necessarily need both but the loose powder obviously wouldn't be the easiest to use on the go! Have you tried either of these products? What's your favourite powder? I'd love to hear! All products are bought by me, unless otherwise stated. I bought both of these powders myself but was kindly sent a back up of Genius Magic Powder. Opinion is always my own.